Heat oven to 400°F. Spray 18x13-inch rimmed baking sheet with cooking spray. In 12-inch skillet, melt butter over medium-high heat. Add cauliflower, onion, garlic, 1/4 teaspoon salt and the pepper. Cook 4 to 5 minutes, stirring frequently, until cauliflower begins to brown on edges and is tender when pierced with knife. Stir in broth and milk; heat to boiling over high heat. Reduce heat; simmer 4 to 5 minutes or until cauliflower is very tender. Remove mixture from heat; cool 5 minutes. Add cauliflower mixture to blender; cover and blend on high speed 3 to 4 minutes or until completely smooth. Add cheese; blend 15 to 30 seconds longer or until incorporated. If thinner sauce is desired, add more milk. Wipe out skillet. Return mixture to skillet. Meanwhile, toss squash noodles with olive oil and 1/2 teaspoon salt; spread evenly on baking sheet. Roast 9 to 11 minutes or until crisp-tender. Do not overcook. Gently stir into sauce in skillet. Top with parsley. Using prespiralized butternut squash noodles measured in ounce-weights? We used 22 oz of noodles in this recipe. To spiralize a butternut squash, cut off bulbous seed-filled bottom third of squash, then peel top two-thirds of squash and spiralize, or use julienne peeler to make noodles. It's easiest to spiralize when working with half of the squash at a time. Use caution when blending hot liquids. Allow hot mixture to cool slightly, and be sure never to fill the blender or food processor over halfway full. It’s best to cover the top of the blender or food processor with the cover or a towel to prevent any hot liquid from splattering. Finally! Comfort food that you can eat without remorse! 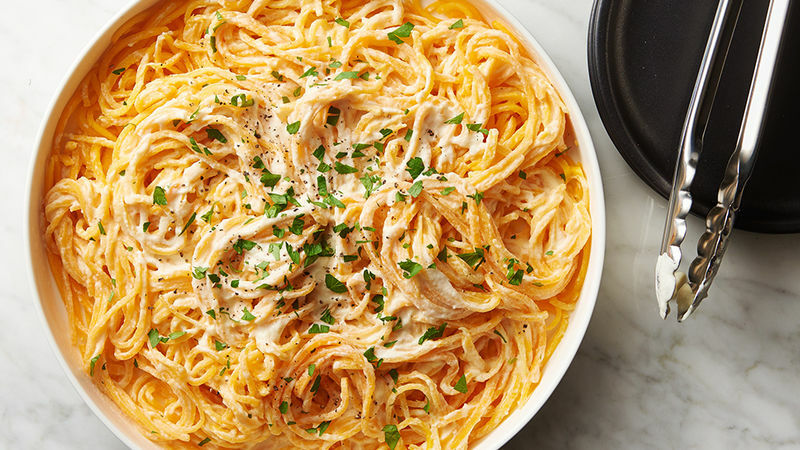 This pasta-like recipe is carb-free thanks to butternut squash noodles and cauliflower Alfredo. It’s a healthier version of your favorite pasta dish, but it’s still creamy and full of flavors. Did we mention it’s loaded with veggies? No spiralizer? No problem! These days, you can buy already-spiralized veggie noodles at the store, including sweet potato noodles, zucchini noodles, butternut squash noodles; it’s worth doing because you can make these veggie noodle recipes. If you have never thought about buying or using a spiralizer, this recipe makes a strong case for it! But if you’re not ready to make your own veggie noodles, but still want in on the butternut squash craze, then we’ve got butternut squash recipes for you right here!